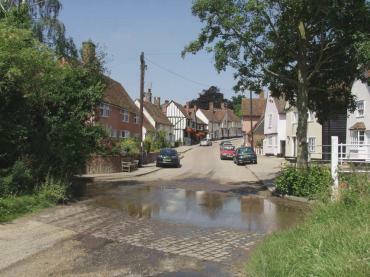 BeenThere-DoneThat: The village of Kersey, Suffolk. 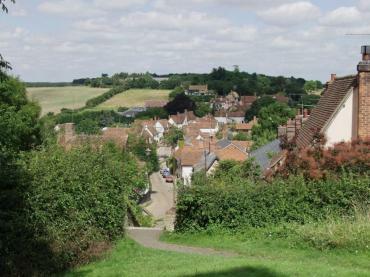 Kersey is a small picturesque village about 2.5 miles north-west of Hadleigh. If it wasn't for the cars parked in the main street it would be possible to imagine that one has, somehow, slipped back 500 years through a time warp. There is, here, scarcely a building without character from the timber framed Bell Inn to River House by the ford with its massive Elizabethan door. If you plan to visit Suffolk you cannot possibly leave without seeing Kersey. Kersey looking in the opposite direction, north-west, along The Street which, unusually for a village of this age, is quite wide. Long before Shakespeare's time Kersey was famous for Kersey cloth which made the village prosperous. 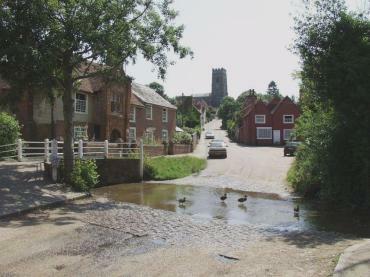 The ford or water splash, is actually a tributary of the River Brett which flows through Hadleigh. 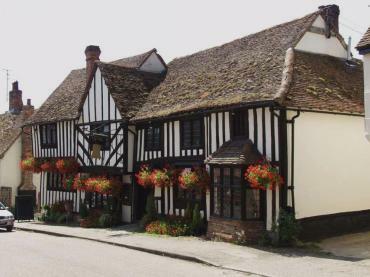 The timbered gable of the Bell Inn with its hanging baskets can be seen on the left of the road. Kersey from St. Mary's churchyard. The water splash, or ford, can just be seen (the dark band) beyond the three parked cars together with the half-timbered gable of The Bell Inn a little beyond that (a single red hanging flower basket gives a clue as to its position). Although most of the buildings have tiled rooves you may notice one cottage with a thatched roof (dark hay colour) at the top of the village at the far end. The 14th century Bell Inn. Lots of oak beams, flagstone floors and, of course, it is supposed to have a resident ghost. It has a varied menu and the food is good! Kersey has its own small pottery producing distinctive stoneware. This pottery uses a special blend of local materials to achieve a spectrum of glazes with unusual textures and flashes of iridescent colour with each individual piece having six or more glaze applications. 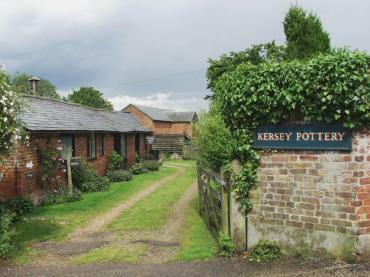 Kersey Pottery is housed in some attractive old stable buildings in The Street.